Citrus Catering & Events: The Foodie Blog: Happy 100th Birthday Julia! Who doesn't love Julia? 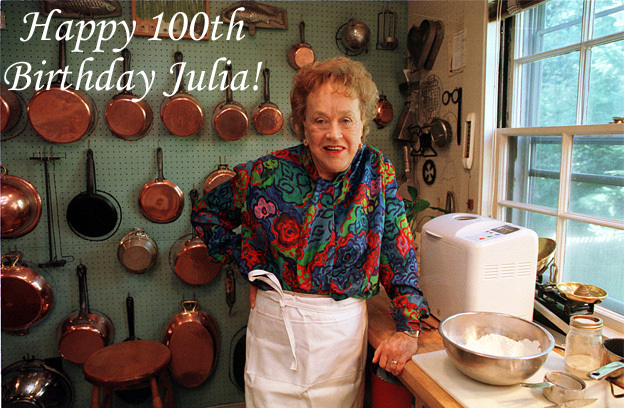 She was funny, talented and she introduced America to not just french cuisine but classic technique for the home cook and of course BUTTER. I've watched many episodes of The French Chef and her other shows, I've even posted several of them here and I never get tired of them. She is such an inspiration. So today let's celebrate her by cooking and eating something amazingly delicious....hopefully with lots of butter. I'll be making her classic Coq au vin for dinner along with her Tarte Aux Fraises (Fresh strawberry tart) for dessert on Friday to celebrate her... photos to come! Happy Birthday Julia! Bon Appetite!